Today at Bloggers Challenge it is FARM FRESH.. and I really thought I might break out some punches and create some farm animals... but time wasn't that good to me! However I did manage to find some tractors that someone had given to me a while ago that haven't been inked up in a long time. I made great attempts to color it with a waterbrush.... actually it doens't look too bad. I paired it with some masculine retired papers and wa la... completed card!!! I love with it all comes together!! Head on over to Bloggers Challenge and see what the others plowed up! that is perfectly farm fresh! awesome masculine card. 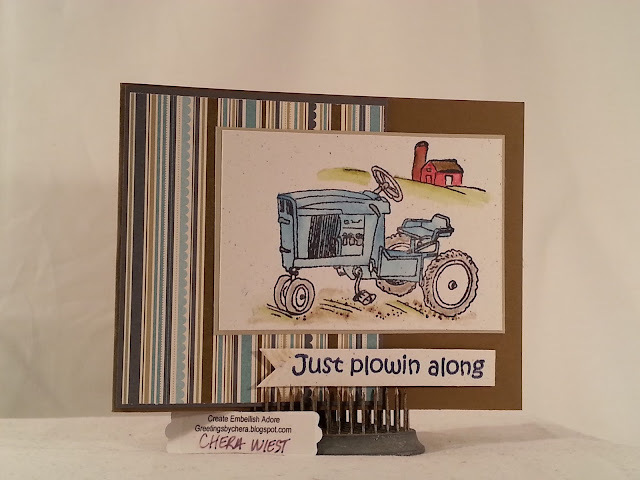 Wonderful masculine card - love the old tractor! Thanks for playing along with the Bloggers Challenge!